This is a beautifully moist, rich fudge cake. Grease and line 2 18cm sandwich tins. Place margarine, sugar and eggs into a bowl with the flour, baking powder and cocoa. Add 2Tbsp of hot water and beat well together with an electric mixer for 2-3 minutes. Divide the mixture evenly between the sandwich tins and bake for 25-30 minutes until risen and springy to the touch. Melt the butter and chocolate with with the milk in a bowl over a pan of simmering water. Sieve the icing sugar and cocoa into a bowl and using a wooden spoon, beat in the chocolate mixture along with 1Tbsp hot water. The mixture should be thick enough to spread onto the cake. (If not, leave to cool a little). Sandwich the sponges together using a quarter of the icing. Use the remaining icing to cover the top and sides of the cake. 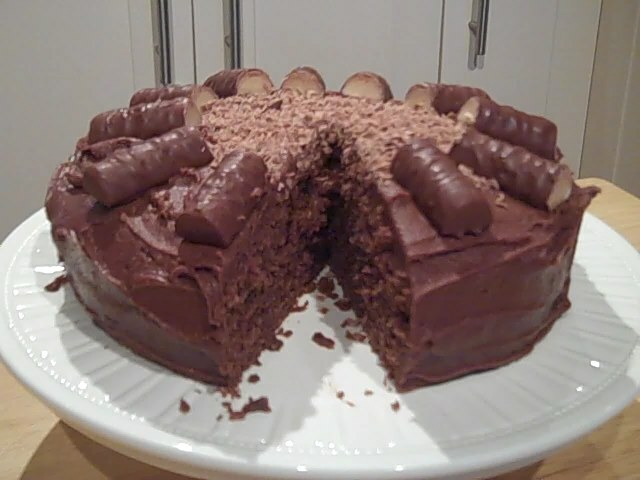 Grate the 1 piece of chocolate and sprinkle in the centre of the cake.